Dr. Dave Hillis shares his experience as a VGB client. Dr. Dave himself has undergone the Virtual Gastric Band procedure and can speak firsthand of the success this remarkable process offers. Dr. Dave once weighed 255 pounds and knew he needed to improve his health. The Virtual Gastric Band procedure helped him achieve his goal safely. Now after losing 64 pounds and personally experiencing the many benefits of the VGB procedure, Dr. Dave Hillis is compelled to bring this solution to others. The non-surgical gastric band, or as it is better known, the Virtual Gastric Band, leverages the power of the mind rather than the scalpel to provide extremely safe and predictable weight loss results. The Virtual Gastric Band procedure offers all the benefits of the surgery but none of the risks, discomfort or necessary recovery time associated with the invasive procedure. This mind management technique was pioneered by Sheila Granger in the United Kingdom. Dr. Dave Hillis, in union with Sheila Granger, is bringing the success of this remarkable weight loss program to Western Michigan. To schedule a consultation please use our brief contact form. To better understand and appreciate the advantages of the Virtual Gastric Band procedure it is helpful to have a basic understanding of the surgical counterpart. The principle behind the surgical operation is to reduce the volume of the stomach cavity and thereby force an individual to consume less food. With reduced food intake, weight loss should follow. Along with the reduced stomach volume the patient will receive instructions regarding what to eat, when to eat, and how to eat. If the patient chooses to overeat, eat too quickly, or disregard dietary restrictions, they will become ill and physically incapacitated. As with any surgery there is risk and a recuperation period. In contrast there is no risk associated to the Virtual Gastric Band nor a period of recuperation. 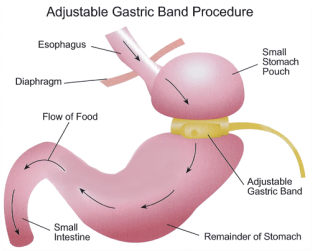 Below is an image illustrating the surgical gastric band and a video presenting the procedure. You may also like to consider information presented by the National Library of Medicine. The Virtual Gastric Band AdvantageThe Virtual Gastric Band brings a 95% success rate, no dietary restrictions, no recuperation period, no physical risks, and no adverse side effects. In short, you are empowered to move into a new healthier life style and experience lasting weight loss results. Using the mind's ability to imagine or visualize the gastric band procedure, the body will respond as if you have undergone the actual surgical procedure. You will desire less food and will make wise food choices. All of this will lead to a healthier and happier you. Why expose yourself to unnecessary discomfort and risk when such a powerful weight loss solution is available? For a free no obligation consultation contact Dr. Dave Hillis and join those experiencing the benefits of the Virtual Gastric Band.